Postcard Printing Services - Next Day Postcards at 24 Hour Print! Postcards are not only for sending greetings and messages to your friends and relatives. You can also use postcards to promote your business or use as party or event invitations. Here at 24 Hour Print, we can help you create elegant and professional postcards for your personal or business needs. Our postcard printing services make use of thick and high quality card stock; with options of gloss and matte finish. Uncoated card stock option is also available for that vintage or earth-friendly postcard look. With a wide variety of sizes available, it’s also easy to create custom postcards. Planning to send your best hopes to your family and friends on this special occasion and you just feel like adding a personal touch? Design your own postcard! Insert your photo or any image which you think is relevant to the people who know you. Throw in a general wish for your loved ones for the holidays and you’re good to go. Once printed, you can then write your personal individual message to the recipient. Sending business postcards on special occasions is a very good marketing move. This gives your clients the feeling of being remembered on the holidays. It shows them that you value their continuous patronage of your product or service. 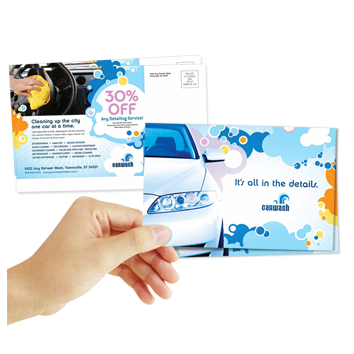 We offer flat and folded postcard printing. Use flat postcards for short messages and thank you notes to send to your clients. On the other hand, folded postcards – in half-fold or letter-fold – are more suited for formal greeting such as wedding invitations or greeting cards. Need rush postcard printing service? We offer next day and 48-hour turnaround for our flat cards for a minimal cost. Standard turnaround time is 3 business days for both flat and folded cards. Call us at 1-844-380-7056 or launch Live Chat for more information. Any size from 4" x 4" to 11" x 6"